Grand Prize: The Grand Prize winner of the highest-rated design will receive a Wacom Cintiq 22HD pen display! Cintiq 22HD features a 21.5" high-definition (1920 x 1080) LCD that delivers a high-quality visual experience along with plenty of room to edit, design and create. Photographers, designers, animators and other creative professionals can work naturally and intuitively directly on the surface of the screen. *Guest Judges' picks (4): Our guest judges will each select their personal favorite design, and those artists will win $400 cash! *Guest Judges include Steve Sansweet, Chris Hardwick, Adrianne Curry & Rebel Force Radio. 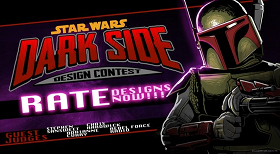 UPDATED: Here's a follow up on the Star Wars Dark Side Design Contest; today they opened for ratings, so fans can now head over and tell them which of the tees they think are worthy of the big prizes! The public ratings will help determine the grand prize winner as well as all the finalists. Click here to rate entries now!